The Modi juggernaut, which till some time ago seemed to be far from invincible, is on shaky grounds. “HAMARI bhool, kamal ka phool” (our mistake, choosing the Lotus) a slogan first raised by textile traders of Surat during their protests against the imposition of GST, is reverberating across Gujarat, predictions of pollsters notwithstanding. The Modi juggernaut, which till some time ago seemed to be far from invincible, is on shaky grounds. The confidence and flashiness so part of Modi is now lost. A party fighting with its back to the wall had the Election Commission delay the announcement of polls. For the first time we knew of the date when results would be proclaimed without being informed of the poll dates! The ECI’s explanation that the ongoing flood-relief operations in the state obligated it, was received with scorn and scepticism. This window was utilised to announce various schemes worth nearly Rs 11,000 crore in an attempt to placate the disenchanted electorate. It also appointed chairpersons to 18 boards and corporations, posts that were kept vacant for the past several years. Even the BJP-run Ahmedabad Municipal Corporation cleared proposals worth Rs 530 crore in just under 10 minutes. For this it advanced its standing committee meeting by 90 minutes in expectation of the announcement of the poll schedule. All these but underline the defensiveness in which the BJP finds itself today. Even the tenor of the latest campaign video released by the BJP is defensive in nature. As was expected, these proclamations have been met with marked disdain and contempt. People see this as yet another of the many jumlas that the BJP has been indulging in. No wonder the slogan Vikas Gando Thayo Che (development has gone crazy) has resonated. Social media platforms are awash with sarcasm directed against the BJP, ridiculing its claims and promises. While Prime Minister Modi announced that there is no need for him to campaign in Himachal Pradesh as he was confident of the BJP’s victory there, he did not sound so about Gujarat. The tepid response to the Gujarat Gaurav Yatra that the party took out recently, has unnerved both the PM and his party. Not long back BJP chief Amit Shah’s public meeting was disrupted in Surat. Leaving nothing to chance, Modi has made five visits to the state in the past two months alone. Many more such visits are lined up in the run up to the polls. Its “Gujarat Model of Development”, having been unravelled, the BJP is shifting gears. Unlike during the 2012 campaign, Modi cannot cast blame on a central government that is presumably stalling development. Unable to showcase any tangible achievements during its long uninterrupted rule, Modi’s tirade is against the dynasty, while Love Jihad and Islamic terror were themes harped upon by Uttar Pradesh chief minister, Yogi Adiyanath. Taking this communal narrative further, chief minister Vijay Rupani targetted Congress leader Ahmed Patel personally, attempting to link him with a suspected ISIS operative. Surely, much more is in store in the course of the campaign in the days leading to the poll. The despondency within the BJP was visible at the time of the Rajya Sabha elections itself. It had transformed a routine biennial Rajya Sabha election into a high-stakes contest, but ultimately failed in achieving its objective. Why have the people who gave all the 26 Lok Sabha seats from the state to the BJP in the 2014 Lok Sabha elections turned against it so quickly, was a question one kept repeatedly asking? Was it because of its failure to deliver or was there a mismatch between delivery and expectations? AIKS state secretary, Dayabhai Gajera pointed to the simmering discontent among the peasantry. Elaborating, he said the MSP for groundnut has been fixed at Rs 900 per 20 kgs, as against Rs 1500 that Modi had promised during the 2014 campaign. The promised centres to be set up by the Gujarat Co-operative Marketing Federation Ltd (Gujcomasol) and other agencies for procurement of groundnut on behalf of the National Agricultural Cooperative Marketing Federation of India Ltd (Nafed) are yet to come up. Even the few that have been set up are just to hoodwink the farmers, he alleged. This is forcing kisans to sell groundnut in the open market at Rs 750 to 800 per 20 kgs. For Tur, while the promised rate was Rs 1,010 they are getting only Rs 600. Promised rates are not being given for crops like soyabean and cotton either, he rued. Adding to their bitterness is the feeling of being duped in the name of crop insurance. Peasants in many districts complain of non-payment or very low payment of crop insurance under the Pradhan Mantri Fasal Bima Yojna, despite their having paid high premiums to private insurance companies designated by the government. Complaints of such nature are galore in the districts of Jamnagar, Rajkot, Junagadh and Amerli in the Saurashtra region. Further, the acute short of drinking water even in several municipal areas in Saurashtra, where piped water is received once a week only, has only compounded matters. In some places like Upleta in Rajkot district, it is much more serious, with water coming only once in three days. The unending wait for the promised waters from the Narmada continues with hundreds of kilometres of canals yet to be laid. The flawed priorities of the government have also drawn all round flak. One among these is the proposed bullet train between Ahmedabad and Mumbai. A quick search at travel portals returned a fare at a minimum of Rs 1,217 for a 1.15 hour air journey from Ahmedabad to Mumbai. For those with a phobia for air travel, the fare by Shatadi Express for a six hour travel by chair car costs around Rs 1000. These apart, there are any number of overnight trains from Ahmedabad to Mumbai. Why then should anyone shell out the speculated Rs 4000 for a three-hour ride by the bullet train? No prize for guesses. The adverse effects of demonetisation are also adding to the woes of the BJP. In Jamnagar, brass parts manufacturer, Bhatuk Dobaria pointed out that his unit is running to just half its capacity. It was only a year ago that he had invested heavily and expanded capacity. He however found solace in the fact that his unit is running unlike smaller ones that have either closed down or are facing an uncertain future. During Diwali, normally demand peaks, but this year it was bleak, moaned Ashok Dedania, owner of a printing press in Ahmedabad. The informal economy in shambles, the imposition of GST only worsened matters further. Traders, one of the staunchest supporters of the BJP till now are up in arms against it. Surat witnessed one of the largest mobilisation of traders against the GST and the government’s policies in July this year. But it is not that no one has prospered under BJP rule. The rise of Adani’s business empire coincides with the ascent of Narendra Modi. A newsclick.in report says that Adani Group’s revenue increased 20 times in a span of 12 years from Rs 3,741 crore in 2002-03 to Rs 75,659 crore in 2014-15. The Adani group was allotted land for setting up a Special Economic Zone at Rs 1.32 per sq. meters as against the average market price of Rs 1,100, resulting in an estimated loss of Rs 6,546 crore to the state government. The Tatas were handed over land forcibly acquired from farmers at Sanand for its Nano car factory for a song. While a few have gained, the vast majority who were left out of this skewed development trajectory are seething with anger. High cost of private education (the public education system has been systematically undermined) and the failure to get employment is leading to unease among large sections of the people. The angst among the powerful Patidars (Patels) who constitute around 16 per cent of the population and were till recently ardent supporters of the BJP, is one such expression of failed aspirations. A new young leader, Hardik Patel emerged, championing them. Opposing the demand for inclusion of Patidars in the OBC category, the organisation of OBCs headed by Alpesh Thakore has become a rallying point amongst the OBCs. Alpesh headed an organisation that was campaigning against alcoholism amongst the OBCs. It is no secret that despite prohibition, liquor is freely available in Gujarat, thanks to a corrupt home department. Remember somebody had said Na kayange, na kisi ko kane denge! The disenchantment among the dalits also came to the fore in the wake of the public flogging of dalit youths in Una in the presence of the police. The huge rally held in the aftermath of these beatings at Gandhinagar saw the arrival of a new dalit leader Jigneesh Mewani around whom the mass of the dalits seem to have galvanised. Notwithstanding their contradictions and pulls, leaders of these grouping can ignore the voice of the masses they represent, only at their own peril. This discontent amongst the people found reflection in the elections to district and taluka panchayats held in 2015 where the BJP lost in a majority of these bodies. 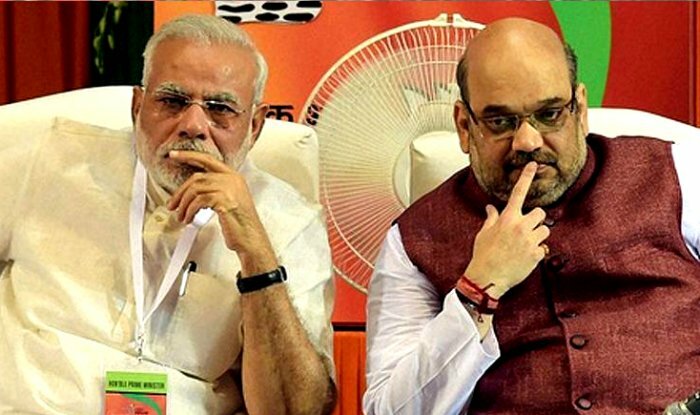 To make matters worse for the BJP, the party lacks a credible leader at the state level, with the Modi-Amit Shah duo, having successfully decimated all others, over the years. The Congress which is the main opposition in the state, is a ramshackle of its earlier self. Powerless and rudderless, it has been riddled with factionalism and defections. It has conducted no major agitation during the course of the last many years and has remained cut off from the people. It is offering no alternative policy plank either. Defeating the BJP would be the main task before the CPI(M). The CPI(M) with pockets of influence in some districts will be contesting a limited number of seats only, revealed Central Committee member and former state secretary, Arun Mehta. The BJP which won 115 seats in 2012 by polling 48 per cent has pompously set a target of 150. On the other hand, the Congress, which had won 61 seats by polling 39 per cent is hoping to make it to Gandhinagar backed by anti-incumbency. The outcome of the 2012 assembly polls, many said, set the tone for the launch of brand Modi on the national scale. Will 2017 be his undoing? Will the 4.33 crore voters of Gujarat make amends for the “bhool” by casting away the “phool”? December 18 is not far off.